Road trips are all the rage lately, and part of the fun of a good road trip is stopping at quirky roadside attractions along the way. And although there are a mind-numbing number of these fun stops throughout the US, here are some of my favorite roadside freebies for wheelchair-users and slow walkers. Located in sleepy little Traver, Bravo Farms (www.bravofarms.com) offers a much needed break from California’s monotonous Highway 99. 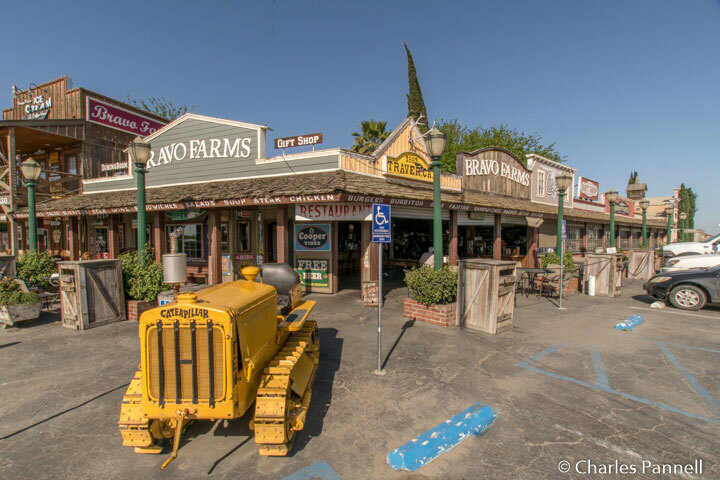 To be fair, this gift shop-restaurant-farm-cheese factory and all around repository of some of the most unusual vintage bric-a-brac that I’ve ever seen, has three other locations; but since the Traver one is the flagship, it’s also the kitschiest. Accessible parking is located near the restaurant, and there’s level access to the restaurant and gift shop, and accessible restrooms near the deli. The gift shop has a wide selection of local products including Bravo Farms Cheese, (they have samples) and there’s even a wine tasting bar at the far end. And if you arrive at the right time you can also get a gander at the cheese-making process. Out back there are level pathways around old wooden buildings that are lined with vintage road signs and filled with everything from old bicycles, farming implements, tools, trunks and even a cash register. Save some time to visit with Quincy the macaw, pet the incredibly cute goats, and check out the fancy chickens. A great stop for kids of all ages! 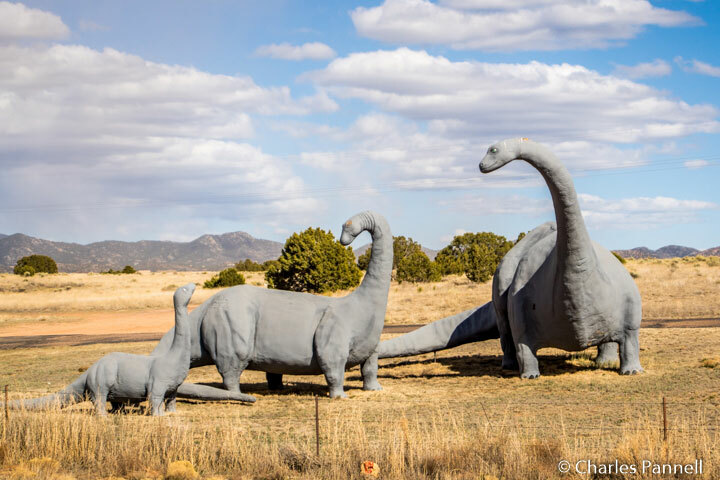 This life-size brontosaurus family can be found just outside of Santa Fe, New Mexico. Believed to be the work of the late Larry Wilson who made a name for himself by crafting dinosaurs out of polyurethane foam, this out-of-the-way roadside attraction is a bit tricky to find, but well worth the effort. From Interstate 25, take exit 278, then go south on Highway 14. Turn left at the first light (Rancho Viejo Boulevard), then go left at the Bureau of Land Management sign on Dinosaur Way. The family is located about a mile down the road on the right, next to a green metal building. The sculptures are located on private property but there is a level grassy pullout along the road where you can get a good look at them. There’s no accessible parking or pathway to the sculptures, but truly there’s a great windshield view from the pullout. As an added bonus, there’s also a T-rex busting out of the adjacent metal building, which made the news in 2001, when Wilson put an Osama bin Laden dummy in its jaw. This roadside attraction is just a short detour off the highway, and a definite must-see on the drive between Albuquerque and Santa Fe. At first glance Russell’s Travel Center (www.russellsttc.com) looks like your average truck stop; however once you step inside you’ll soon discover a hidden gem on New Mexico’s Interstate 40. 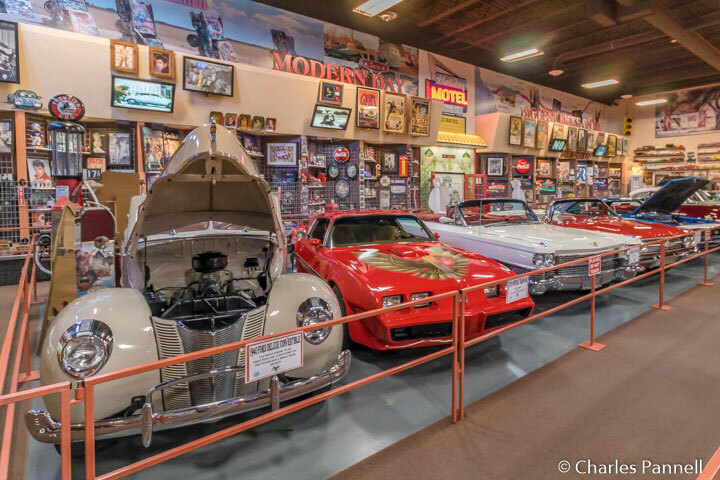 Located at exit 369, just west of the Texas border, this roadside rest has all the usual truck stop accoutrements, but it also includes a first-rate vintage car museum. Accessible parking is available near the entrance, with level access to the building. Inside there’s barrier-free access through the restaurant, around the Subway counter, to the back of the building, where you’ll find the car museum. Highlights include a 1955 Corvette Roadster, a 1959 Ford Galaxie Skyliner and a 1957 pink T-bird convertible. There’s good pathway access around all the cars, which are surrounded by a plethora of memorabilia, from vintage photos, toys and gas pumps, to a nice collection of 1950s children’s push cars. Add in the vintage tunes playing on the juke box and you have the full nostalgic experience. Best of all, there’s no admission charge to the museum, but donations (which go to a local food bank) are gladly accepted. 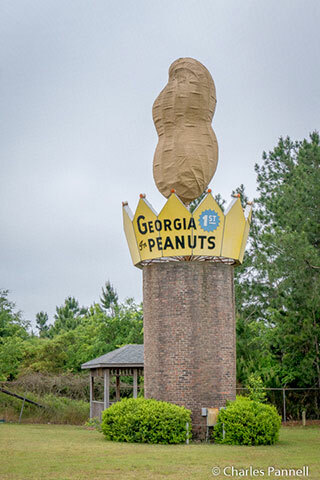 No list of roadside attractions would be complete without at least one “world’s largest” inclusion; so with that in mind I give you The World’s Largest Peanut in Ashburn, Georgia. You can spy the stately goober from I 75, just south of exit 82 on the west side of the highway; but for a closer look, take the Washington Drive exit and turn west, then make a left on Whittle, between Zaxby’s and the Pizza Hut. The big nut can be found on a small service road on the left, about a half-mile from the turn. There’s a small paved parking lot, and although it’s not striped it is level and seems adequate for the amount of traffic the peanut gets. There’s level access over to the nut, but if you are expecting a big peanut gift shop filled with tasty treats, coffee cups and t-shirts, you will be sorely disappointed, as the only thing at this stop is a commemorative plaque, a picnic shelter with one step up into it and of course the peanut. Still it’s a fun stop, and there’s a journalistic twist to the nut too, as it was erected in memory of Nora Lawrence Smith, the former editor and co-publisher of the Wiregrass Farmer, Turner County’s award-winning newspaper. So why a peanut? It is of course Turner County’s most important agricultural product. As an added bonus, if you hit this site after dark, it’s also lighted. 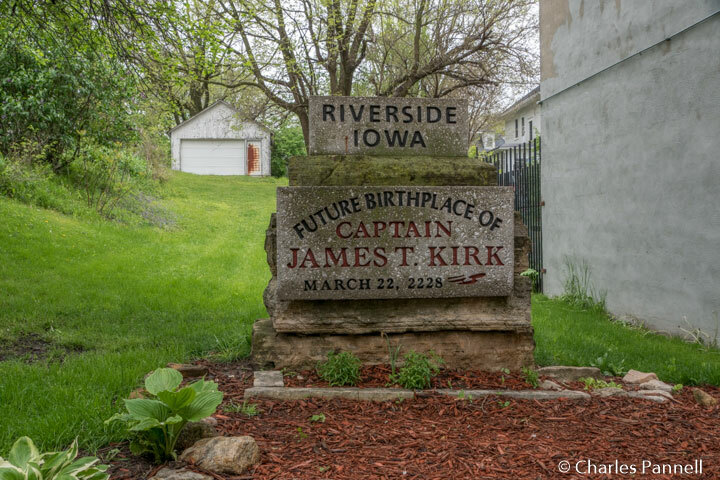 Most Trekkies know that Captain James T. Kirk hails from Riverside, Iowa; but few folks realize that there’s already a commemorative plaque marking his future birth in this sleepy little Midwestern town. And I say “future”, because as we all know, Star Trek is set in the future, and the popular Enterprise Captain won’t make his blessed appearance until March 22, 2228 (according to The Making of Star Trek, by Gene Roddenberry). The plaque commemorating Kirk’s future birth is located behind the New Image Salon at 51 W. First Street. To get there, take Highway 218 south from Iowa City, then go west on Highway 22 until you hit Riverside. Follow the main road through town until it turns into First Street. The New Image Salon is on the right, just after the elevated sidewalk begins. The best option for wheelchair-users is to park in the gravel parking lot down the road from the New Image Salon at Glasgow and First Streets. From there it’s a level roll to the small area behind the salon, where you’ll find a nicely manicured site with a bench and a plaque dedicated to Captain Kirk. It’s important to note that if you park in the street, you’ll have to negotiate four steps in order to reach the salon. It’s a good idea to visit Riverside on a Tuesday through Saturday, which is when the Voyage Home Museum is also open. It’s located just down the street from the salon at 361 E. First Street. You can’t miss it as there’s a model of the Constitution-class USS Riverside on a trailer in the parking lot. There’s no striped parking in the lot, but it’s paved and level, and there’s barrier-free access over to the combination museum and gift shop. The only accessible parking space I spied in town was next to the park, which really isn’t a good option, as you have to roll out in the street around a blind curve to get to the museum. So park in the paved lot, in a way you won’t get parked in, and you’ll be good to go. Don’t expect much in the way of services in this tiny town though. If you’d like to lunch there it’s best to pack along a picnic and enjoy it in the park across the street from the museum. Still it’s a fun stop, and since it’s only about 16 miles off Interstate 80, it’s definitely worth the short detour. Located just outside Omaha, Boys Town (www.BoysTown.org) is the dream-come-true of Father Flanagan. He began his home for orphaned and neglected boys with just $90 of borrowed capital in 1917. Today the Omaha campus is just one of 12 across America. The campus itself is open for self-guided tours, and it’s certainly very scenic and accessible; but the real roadside attraction draw at this stop is located in the Visitor Center. That’s where you’ll find the World’s Largest Ball of Stamps in the Leon Myers Stamp Center. There’s accessible parking in the Visitor Center lot, with ramp access up to the building. Inside, there’s barrier-free access to the information desk, and the sizable gift shop. The small stamp museum is located inside the gift shop, but if you can’t find it, just ask, as the employees are very helpful. The stamp museum contains a number of themed displays that highlight stamps depicting children from around the world; but the piece de resistance is located in a small alcove in the back of the museum. 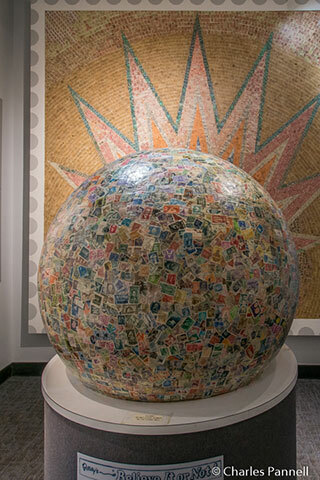 The 600-pound stamp ball, which was crafted by students, is composed of over 4 million stamps and is recognized by Guinness as the World’s Largest Stamp Ball. The stamp collage in the background is an impressive piece on its own, but the stamp ball definitely takes center stage. 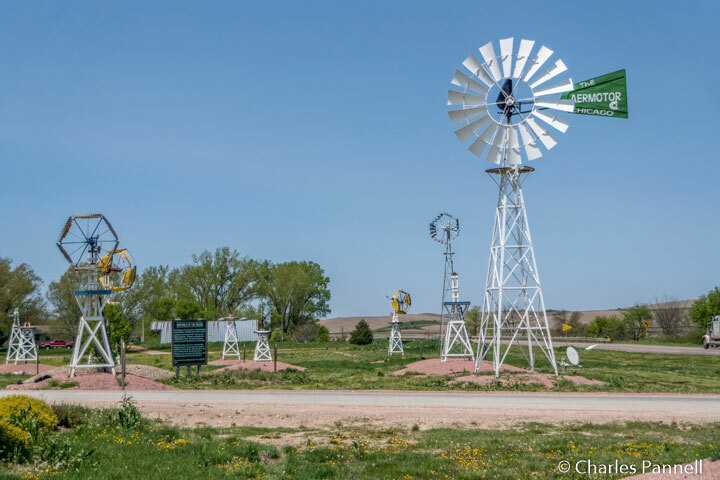 Located near the eastern terminus of the Outlaw Scenic Byway, this collection of vintage windmills is must-see on any Cornhusker State road trip. The open-air museum features nearly 30 windmills that date back to 1880 – 1930, many of which are in working condition. This quirky roadside attraction was made possible by the local Leonard Gill Family, in an effort to preserve a piece of prairie heritage. Most of the windmills are from the Howard and Barvetla McLain Collection of Carroll, Nebraska. They were moved to the site and restored by Marvin Baker of Pender, Nebraska. In some cases restoration was an arduous process, as parts had to be fabricated, because they were no longer available commercially. The result is an impressive and very rare exhibition of what’s billed as one of the finest collections of vintage windmills in the world. The windmills are located on the south side of Highway 20, in front of the LP Gill Landfill. There’s no real parking area, but there is a wide level dirt space where you can pull over to get a better view of the site. In dry weather it’s possible to walk around the grassy area where the windmills are planted, but after a rain it can get pretty muddy. Even if you can’t manage the walk over the grass, it’s still worth a stop to catch a panoramic view of the windmills on the horizon. It’s an impressive sight indeed. No trip through the Cornhusker State is complete without the obligatory stop at Carhenge, located about three miles north of Alliance on Highway 87. The structure, which was built to replicate Stonehenge in England, was erected at a 1987 family reunion, as a memorial to Jim Reinders’ father. It was appropriately dedicated during the summer solstice of that year. The cars that comprise the sculpture are largely from the 50s and 60s and they are all American made. Previously there were three foreign models included, but they have since been removed and buried at the site. The circle of implanted cars replicates the placement of 38 of the major stones at Stonehenge. 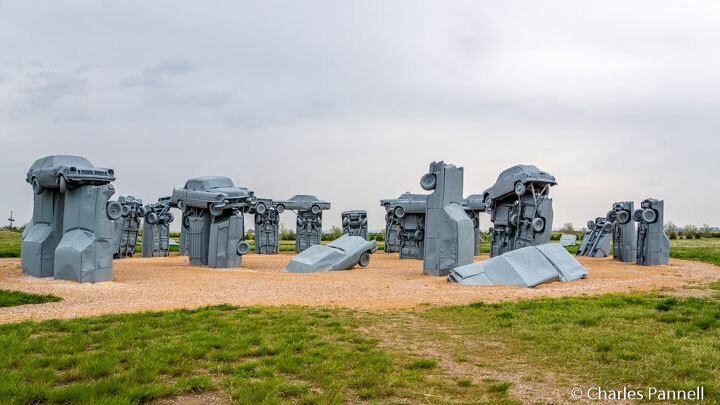 Originally Carhenge remained unpainted for many years, but it was subsequently painted flat gray to more closely resemble the original structure. In contrast, the Car Art Preserve, which is also located at the site, features a variety of colorful sculptures made from old cars and car parts. There’s no striped parking at the site, but the lot is level, and is made of hard-packed dirt with bits of large gravel on top. The best place to park is over near the concrete pad at the Pit Stop, as it’s easier to access the dirt trails around Carhenge from there. The pathways that lead through the Carhenge site are made of hard-packed dirt, and they are mostly doable in dry weather. There’s also level access to the Pit Stop, which sells souvenirs during the summer months. Additionally, there are three picnic tables in the parking lot; and although they aren’t technically accessible, it’s still possible to roll up to them and enjoy a picnic lunch. The downside to this site is that Alliance really isn’t on the way to anywhere, so you have to make a concentrated effort to map out your visit to this quirky roadside stop. Still it’s well worth a detour, and chances are you’ll find a gaggle of other hearty road trippers there, even in foul weather. 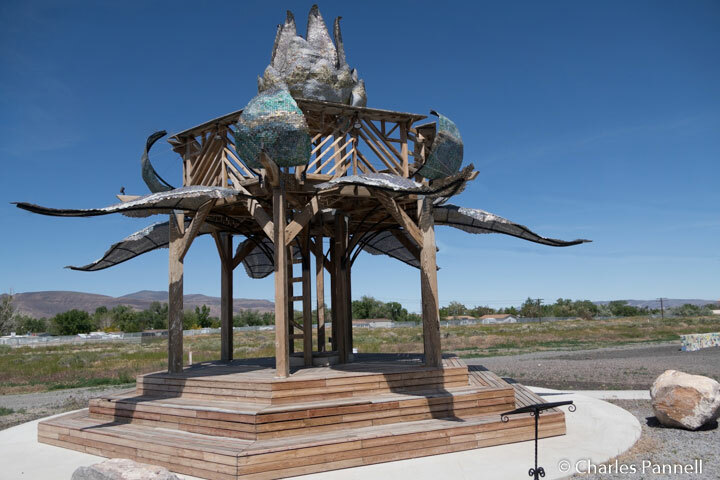 Although it seems an unlikely spot for a modern art installations, Fernley, Nevada unveiled its new Burning Man-inspired Main Street Art Park (www.facebook.com/FernleyArtPark) in 2014. This unique project was made possible through a National Endowment for the Arts grant, and a dynamic partnership between the City of Fernley and the Black Rocks Arts Foundation (BRAF). Since BRAF plays a major role in planning the annual Burning Man Festival in the California desert, they though it would be a good idea to share some Burning Man art with the thousands of festival-goers who pass through Fernley every year. And since the park is located right off Interstate 80, it also makes a great road trip stop on any trek through the Northern part of the Silver State. To find the park, just take exit 48 off of interstate 80 and follow the signs to Fernley. Keep right on Main Street, and look for the park on the right, across the street from the 76 gas station. Although the parking lot is composed of gravel, there’s also an accessible parking spot on a cement pad, with a level sidewalk over to the cornerstone installation – Desert Tortoise. This permanent installation was created by artist Pan Pantoja, with assistance from Fernley Elementary School’s fourth-graders. This 25-foot long and 17-foot tall sculpture was crafted from boulders from a local quarry and decorated with hand painted ceramic tiles that reflect the culture of Fernley and the surrounding area. Although the vision and execution came from Pantoja, the fourth-graders supplied the artist with the creative tiles. There’s level access around the sculpture which weighs in at an impressive 70 tons, and there’s also a smaller slab covered with leftover tiles located next to the tortoise,. There’s a level sidewalk that leads from the tortoise over to the Burning Man installation – Bottlecap Gazebo. Crafted by artists Max Poynton and Andrew Grinberg, the piece was named for the thousands of recycled bottle caps that were individually smashed flat, drilled and strung together with wire to form the leaves of the gigantic flower that tops the gazebo. Bottlecaps were donated from all over the world, by individuals as well as 50 bars and restaurants for this project. Although there are steps up to the gazebo, you can certainly view this piece from the adjacent sidewalk. And even though it’s on temporary loan to the art park, it was still there in 2016, so stop by next time you’re in Fernley – you never know what you’ll find!